Recycled materials - Yes please! The Moonchild Illusion Bandeau tops are made of our new recycled material with a super-soft seamless feel. Each piece is uniquely dyed for an eye-catching design and can be used as a full set or to style-up our solid colors. Available in two beautiful colors combination: Sand/Marsala or Aura/Brittney. 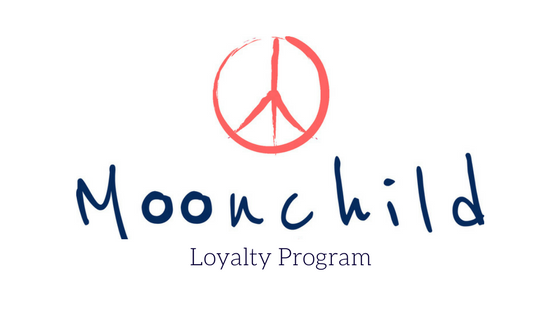 Moonchild Yoga Wear is working with Women for Women International to support women survivors of war rebuild their lives, through a 12-months training program which will help them start their own business. Our leggings are available in five sizes - they are true to size. If you find yourself in between sizes, you will fit both sizes but we recommend to choose the larger size if in doubt. Our tops are available in three sizes. If you are in between sizes, you will fit both sizes. The Seamless Zen Top has a tighter fit than the Seamless Crop Top. Our printed leggings and shorts are high waisted for a body-hugging fit. They are true to size. If you are in between sizes, we recommend to choose the larger size. Our printed tops are made with low to medium support and are without padding. If you are in between sizes, we recommend to choose the larger size. With their unique and comfortable fit, durability and material of the highest quality, the Moonchild Bra Top in the Blazing Sun print is perfect for fitness, hot yoga and swimming. Moonchild Yoga Wear is designed in Denmark and made in EU with certified eco-friendly Italian fabrics. Moonchild’s collections are inspired by the colors and lights of the Scandinavian nature blended with beautiful and feminine minimalism. We are committed to eco-responsibility, and are mindful of every decision we make in the manufacturing process. The Moonchild Hoodie is finally here. The combination of super soft Organic Cotton, a sporty fit and beautiful rose dust color makes this signature Hoodie from Moonchild Yoga Wear a new classic. This lovely long sleeve hoodie features handdrawn "Dream Wild - Moonchild" in white, a front pocket and side seam details. It has a timeless, feminine design and is made from the most sustainable materials. Made with love in Portugal from Organic Cotton. With their unique and comfortable fit, durability and material of the highest quality, the Moonchild Bra Top in the Tigerlily print is perfect for fitness, hot yoga and swimming. Moonchild Yoga Wear is designed in Denmark and made in EU with certified eco-friendly Italian fabrics. The Moonchild Draped Tank is a soft layering piece for your slower yoga classes and fits perfectly with your post-workout wardrobe. This lightweight tank is made of our soft organic cotton and modal fabric. This lovely tank top from Moonchild Yoga Wear is fitted around chest and neck line and has a beautiful twisted draped front. It has a timeless, minimalistic design and is made from the most sustainable materials. Made with love in Portugal from Organic Cotton and Modal.